Railway electrification in Great Britain began during the late 19th century. A range of voltages has been used, employing both overhead lines and conductor rails; the two most common systems are 25 kV AC using overhead lines and the 750 V DC third rail system used in southeast England and on Merseyrail. In 2006, 40%—3,062 miles (4,928 km) of the British rail network was electrified, and 60% of all rail journeys were by electric traction (both by locomotives and multiple units). According to Network Rail, 64% of the electrified network uses the 25 kV AC overhead system, and 36% uses the 660/750 V DC third-rail system. The electrified network is set to expand over coming years, as 25 kV electrification is extended to currently unelectrified lines, such as the Great Western Main Line, the Midland Main Line and lines in the North of England as part of the Northern Hub. The first electric railway in Great Britain was Volk's Electric Railway in Brighton, a pleasure railway, which opened in 1883, still functioning to this day. The London Underground began operating electric services using a fourth rail system in 1890 on the City and South London Railway, now part of the London Underground Northern line. The Liverpool Overhead Railway followed in 1893, being designed from the outset to be electric traction, unlike the City and South London Railway which was designed to be cable hauled initially. Main line electrification of some suburban lines began in the early years of the 20th century, using a variety of different systems. The Mersey Railway converted to 600 V DC electric multiple-unit operation on 3 May 1903, thus eliminating the problems caused by steam traction in the long tunnel under the River Mersey, and the Lancashire & Yorkshire Railway's Liverpool Exchange to Southport (and on to Crossens) suburban commuter line was similarly electrified at 625 V by March 1904. Both of these lines initially used a fourth rail system, In 1921 a government committee chose 1,500 V DC overhead to be the national standard, but little implementation followed and many different systems co-existed. During the interwar period, the Southern Railway adopted the 660 V DC third rail system as its standard and greatly expanded this system across its network of lines south of London. After World War II and the nationalisation of the railways in 1948, British Railways (BR) expanded electrification at both 1,500 V DC overhead and 660/750 V third rail. In 1956, BR adopted 25 kV AC overhead as standard for all projects outside logical extensions of third-rail systems. The 25 kV AC network has continued to expand slowly, and large areas of the country outside London are not electrified. In 2007, the government's preferred option was to use diesel trains running on biodiesel, its White Paper Delivering a Sustainable Railway, ruling out large-scale railway electrification for the following five years. In May 2009, Network Rail launched a consultation on large-scale electrification, potentially to include the Great Western Main Line and Midland Main Line and smaller "in-fill" schemes. Key benefits cited were that electric trains are faster, more reliable and cause less track wear than diesel trains. Since then, electrification of the Great Western Main Line has been approved; electric trains are planned to run to Bristol from 2016 and Cardiff from 2017. Electrification of the Midland Main Line, several Trans-Pennine routes and the Welsh Valleys has also been approved but subsequently cut back considerably. In Scotland, where transport is devolved to the Scottish Government, Transport Scotland is extending electrification, for example, on the Airdrie-Bathgate Rail Link. This is part of a larger plan that sees many major routes in central Scotland electrified, including the main Edinburgh Waverley – Glasgow Queen Street route. In June 2011, Peter Dearman of Network Rail suggested that the third-rail network will need to be converted into overhead lines. He stated, "Although the top speed is 100 mph, the trains cannot go over 80 mph well and 25% of power is lost from heat". Agreeing that conversion would be expensive, he said that the third rail network is at the limit of its power capability, especially as trains become more advanced in technology. The July 2012 Department for Transport High Level Output Specification for Network Rail Control Period 5 includes the conversion of the South Western Main Line between Southampton Central and Basingstoke from 750 V DC third rail to 25 kV AC overhead as part of a scheme to improve rail freight capacity from Southampton Port. This conversion is a pilot scheme to develop a business case for full conversion of the third rail network. The ORR has also stated that on safety grounds, third rail 750 V DC has a limited future. Electrified from the late 1950s to the mid-1960s using the Mark 1 series under the BR 1955 Modernisation Plan to Crewe (and branches), extended to Glasgow in 1974. Northampton: see Northampton Loop Line. Birmingham New Street: see Rugby-Birmingham-Stafford Line. Liverpool Lime Street including newly electrified routes to Manchester via Newton-le-Willows and to Wigan North Western via St.Helens Central in 2015. Manchester Piccadilly: see Stafford to Manchester Line and Crewe to Manchester Line. The "Abbey Flyer" (St Albans Branch Line) was electrified 1987-88 by Network SouthEast. In 2003, the Crewe to Kidsgrove section of the Crewe to Derby Line was electrified as a diversionary route for the WCML. Since 1999, the line has been modernised and the overhead line equipment has been refurbished and renewed from Mark 1 / Mark 3A to UK1 range to allow an increase line speeds from 110 mph to 125 mph (with 140 mph capability in areas previously fitted with Automatically Tensioned Mark 1 equipment - subject to upgrading of the balance weight arrangement to provide individually tensioned contact / catenary wires and regrading of the contact wires). At the same time sections of the line are being progressively changed to autotransformer system. The majority was originally electrified at 6.25 kV, final sections converted to 25 kV in March 1989. This covers the lines from London Liverpool Street (Bethnal Green Jn) to Chingford, Enfield Town, Hertford East and Cambridge. In the 1960s, the lines to Chingford, Enfield Town and Cheshunt were electrified at 6.25 kV, from Cheshunt to Bishop's Stortford and Hertford East at 25 kV. The Lea Valley line between Coppermill Junction and Cheshunt was electrified at 25 kV in 1969. All the 6.25 kV areas were converted to 25 kV in 1983. In 1987, electrification was extended from Bishop's Stortford to Cambridge at 25 kV. 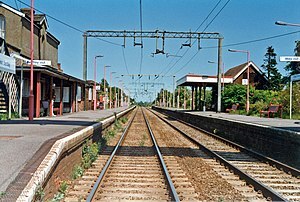 In 1990 the line to Stansted Airport opened, and in 1992 electrification was extended from Cambridge to King's Lynn along the Fen Line. Converted from 6.25 kV/1,500 V DC to a combination of AT and FT 25 kV Mark GE (Great Eastern) between 1976 and 1980. Presently being upgraded to the GEFF (Great Eastern Furrer + Frey) range altering the catenary from a compound to simple sagged arrangement. The line between London (Kings Cross) and Royston was electrified between 1976 and 1978 using the Mark 3A range as part of the Great Northern Suburban Electrification Project. This included the Hertford Loop Line. The section between Royston and Cambridge was electrified in 1988 using the Mark 3B range. In 1984, authority was given to electrify Edinburgh and Leeds. The section between Hitchin and Peterborough was completed in 1987, and Doncaster and York were reached in 1989. By 1990, electrification had reached Newcastle, and in 1991 Edinburgh. The Mark 3B range was used throughout the electrification scheme, certain areas are presently being upgraded to the Mark 3D design range, this will eliminate known corrosion issues with the AWAC catenary and replace solid stainless steel droppers with flexible copper current carrying designs. Some headspan to portal conversions are also taking place. In order to keep construction teams working, two additional schemes were authorised, to Carstairs and North Berwick (North Berwick Line). At the peak of the electrification project during the late 1980s, it was claimed to be the "longest construction site in the world" at over 250 miles (400 km). Electrified between London St Pancras and Bedford in 1983 using the Mark 3B range, and Dock Junction to Moorgate - now cut back to Farringdon. Electrification from Bedford to Kettering and Corby using the UK Master Series (MS125) range is expected by 2019 (MML Phase 1), further extensions to Leicester, Nottingham Trent Junction and Sheffield (via Derby) by 2023 (MML Phase 2) were cancelled in July 2017. However the section from Clay Cross to Sheffield will eventually be electrified by 2033 as part of HS2. 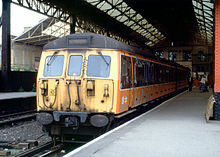 Electrified in 1994 in a joint venture between British Rail and the British Airports Authority using the Mark 3B series. Using part of the Great Western Main Line. Newest main line, completed in 2007. Links London St Pancras with Kent and the Channel Tunnel. North London Line, between Acton Central and Stratford. Various other suburban lines in the north of the city are electrified as part of other routes mentioned above. In 1991, the ECML to Edinburgh was electrified. A few local routes were also electrified. Edinburgh Crossrail: Edinburgh Waverley to Newcraighall. The service is by DMUs, pending reopening of part of the Waverley Line. Glasgow to Edinburgh via Carstairs Line: some North Berwick Line trains continue to Glasgow Central. Intercity trains from the ECML continue to Glasgow Central. The route from Edinburgh to Glasgow via Bathgate has been reinstated between Bathgate and Airdrie and electrified throughout. It opened on 11 December 2010. Approval has also been given by the Scottish Parliament for electrification of the main inter-city route between Edinburgh and Glasgow Queen Street High Level via Falkirk. The project, known as EGIP, was scheduled to encompass infill electrification in the Glasgow area and Greenhill Junction to Stirling, Dunblane and (recently re-opened) Alloa, which mainly carry commuter services, but these were removed in 2012 as part of a cost review. Suburban electrification was begun during the 1960s in the wake of the BR 1955 Modernisation Plan. Electrification was piecemeal and is still incomplete, with several suburban, rural and intercity lines still unelectrified. North Clyde Line: also known as the "Glasgow North Electric Suburban Line", one of the first lines in Glasgow electrified in 1960 (Helensburgh Central, Balloch and Milngavie to Glasgow Queen Street (Low Level) and to Springburn and Airdrie). South Clyde: the Cathcart Circle Line (Glasgow Central to Newton and Neilston) was electrified on 22 May 1962. The Inverclyde Line (Glasgow Central to Gourock and Wemyss Bay) was electrified in 1967. The Ayrshire Coast Line (Glasgow Central to Ayr, Largs and Ardrossan Harbour) was electrified in 1986–1987. The Paisley Canal Line was electrified to Corkerhill from Glasgow Central, in late 2012 extended to Paisley. Argyle Line: between Dalmuir and Milngavie via Glasgow Central (Low Level) to Hamilton Circle, Larkhall, Lanark and Carstairs (via Hamilton, Motherwell or Holytown). There is also peak service to Coatbridge Central. On the Glasgow to Edinburgh via Carstairs Line, some North Berwick Line trains continue to Glasgow Central. A single daily East Coast intercity train from the ECML continues to and from Glasgow Central. On the Shotts Line, Holytown Junction to Kirknewton is not electrified, but both ends are, shared with the WCML, Argyle Line and ECML. The remaining section is to be electrified in mid-2019. The Cumbernauld Line to Springburn and the remaining section of the Motherwell to Cumbernauld Line was electrified in mid 2014. The line between Springburn and Glasgow Queen Street (High Level) has not yet been completed. Until Glasgow Queen Street High Level has been electrified, electric Cumbernauld Line trains reverse at Springburn and run through Glasgow Queen Street Low Level station. The Whifflet Line between Whifflet and Rutherglen via Carmyle was electrified in late 2014. Manchester to Liverpool via Earlstown Line: electrified in 2015 as part of the Northern Hub project. Chase Line: New Street to Walsall electrified 1966. In 2009, Lord Adonis was appointed Secretary of State for Transport. After a gap of more than a decade, electrification was back on the agenda and Adonis announced plans to electrify the Great Western Main Line from London as far as Swansea, as well as infill electrification schemes in the North West of England. In July 2012 the UK government announced £4.2 billion of new electrification schemes, all at 25 kV AC and reconfirmed schemes previously announced by Adonis. These were to be Northern Hub, Great Western Main Line, South Wales Main Line, Midland Main Line, Electric Spine, Crossrail, Gospel Oak to Barking Line and West Midlands suburban lines. Rail transport in Scotland is a devolved matter for the Scottish Government but they too have pursued electrification with multiple schemes in the Central Belt. All these have been 25 kV AC also as in England and Wales. Electrification has not been without controversy with cancellations and various appearances of the Secretary of State for Transport called before the Transport Select Committee. The number of route miles electrified in these years was answered to a written question in parliament. The projects have been subject to cost overruns and delays, and on 8 November 2016 the government announced that several elements of the Great Western Main Line electrification programme would be indefinitely deferred.. In an attempt to mitigate and improve the cost situation the Railway Industry Association published a report in March 2019 detailing why costs had risen and suggested ways forward. Tyne & Wear Metro is the only 1,500 V DC system in the UK. Tyne and Wear Metro: The Tyne and Wear Metro, which opened in 1980, is now the only system left in the UK using the 1500 V DC overhead lines. Although it is often described as "light rail", it is closer to a heavy metro, using only segregated track. Much of its route follows that of the previous Tyneside Electrics, which had been converted to diesel by 1967. Since 2002, the Metro has shared main-line track on the Durham Coast Line to Sunderland. This presents a potential problem for main-line services if routes into Sunderland or Newcastle upon Tyne that use this section were to be electrified at 25 kV AC. Blackpool Tramway: originally 550 V DC, in 2011 upgraded to 600 V to operate more modern rolling stock. The National Tramway Museum at Crich, Derbyshire uses 550 V DC. This voltage was chosen for maximum compatibility with its historic fleet of trams as well as more modern units. The Wirral Tramway uses 550 V DC. The Seaton Tramway uses 120 V DC. Lines through Clapham Junction equipped with third rail electrification. The extensive southern third rail electric network covers south London and the southern counties of Dorset, Hampshire, Sussex, Surrey and Kent. The London and South Western Railway (L&SWR) third-rail system at 660 V DC began before World War I from Waterloo to suburban destinations. The Southern Railway was formed in the 1923 grouping; it adopted the L&SWR system, and by 1929 the London, Brighton and South Coast Railway (LB&SCR) suburban overhead network was replaced by third rail. The South Eastern Main Line was electrified at 600 V, later upgraded to 750 V DC. The third rail extended throughout most South London lines out of all its London termini. Throughout the 1930s, there was much main line electrification, including the Brighton Main Line (including East, West Coastways and related routes in 1932-1933), the Portsmouth Direct Line (4 July 1937) and to Maidstone and Gillingham (1939). After World War II, electrification was soon resumed in the newly nationalised British Railways' Southern Region. The BR 1955 Modernisation Plan included the two-stage "Kent Coast Electrification". The Chatham Main Line was completed, followed by the South Eastern Main Line and related lines. The voltage was raised from 660 V to 750 V. Since then, all electrification has used 750 V; lines electrified before then remain at 660 V. Attention then switched to the neglected former L&SWR area (then the South Western Division). The South Western Main Line (SWML) to Southampton Central and Bournemouth was electrified in 1967 and to Weymouth in 1988. During sectorisation in the 1980s, Network SouthEast conducted extensive infill electrification. The Snow Hill tunnel was reopened, enabling Thameslink. The Hastings Line, Eastleigh to Fareham Line and the Oxted Line (East Grinstead branch) were electrified. This left only a few lines unelectrified: the West of England Main Line, the Wessex Main Line, the North Downs Line, the Oxted Line (Uckfield branch), and the Marshlink Line. Two lines of the Merseyrail network; the Northern Line and the Wirral Line use 750 V DC third rail (see Suburban electrification of the London, Midland and Scottish Railway for its history). See Suburban electrification of the London, Midland and Scottish Railway for its history. In 1970, the North London DC lines and the Class 501 EMUs used on these services were converted for third-rail operation, with the fourth rail generally being removed on sections not used by LUL. Some fourth rail was retained in the Gunnersbury and Queens Park areas for emergency use by LUL. With the closure of Broad Street, the North London Line was joined with the Stratford to North Woolwich line; this was electrified with third rail and overhead line as far as Stratford, third rail to North Woolwich. Two branches of the Watford DC Line have been closed: to Rickmansworth in 1952 (to passengers, to goods in 1967) and to Croxley Green in 1996. The Watford DC Line between Queens Park and Harrow & Wealdstone and the North London Line between Richmond and Gunnersbury are used by London Overground trains designed for 750 V third rail and Bakerloo line trains designed for 630 V third and fourth rail. As a compromise, the nominal line voltage is 650 V, and since 1970 the centre rail has been bonded to the return running rail. There are no special provisions required at Queens Park, where the two dissimilar systems meet, just a gap longer than one coach of a Bakerloo line train at the entry to (and exit from) the Bakerloo, which operates with a nominal -210 V on the fourth rail and +420 V on the third rail. There is no bridging of the incompatible systems as trains pass from one to the other since, like all UK electric trains intended to run extensively in tunnels, there is no continuity of traction power circuits between vehicles of the train. A similar arrangement applies between Putney Bridge and Wimbledon, where the District line runs over tracks owned by Network Rail, which also used by South West Trains, though normally only for stock movements. The Northern City Line connects the East Coast Main Line to Moorgate. It was isolated by the abandonment of the 1930s "New Works" programme (and the development of the Metropolitan Green Belt). Tube services were truncated at its northern end by the Victoria line in 1964 at Drayton Park. The remainder was handed over to BR in 1975 in conjunction with the suburban electrification of the East Coast Main Line. The line uses third-rail DC electrification between Moorgate and Drayton Park, where trains switch to 25 kV AC overhead. The single remaining national rail line on the Isle of Wight was electrified in 1967, so that former London Underground rolling stock could be used, due to the limited height of Ryde Tunnel. The Island Line used 630 V DC third rail, as it was a cheaper option to convert the LUL stock into third rail, and implement third rail only on the line. The rolling stock currently used is BR Class 483s. The London Underground is a large metro system operating across London and beyond, commonly known as "the Tube". Its 408-kilometre (254 mi) is made up of 11 lines; electrification began during the 1890s. It was largely unified between 1900 and 1910 and nationalised in 1933, becoming the railway component of London Transport (LT). A major expansion programme (the "New Works") was launched, in which LT took over several urban branches of mainline railways. The Underground is mostly in north London; its expansion into south London was limited by geology unfavourable to tunnelling and by the extensive main-line network, much of which was being electrified (see "Southern Electric"). The Underground uses a relatively uncommon four rail system of electrification. Two standard gauge rails are the running rails; the outer third rail carries positive current at +420 V DC and the inner fourth rail is the negative return at –210 V DC, giving a supply voltage of 630 V DC. The chief advantage of the fourth-rail system is that, in tunnels with a metallic (usually cast-iron) lining, the return traction current does not leak into the lining causing electrolytic corrosion there or in the neighbouring utility mains. The two running rails are available exclusively for track circuits. The surface sections use the fourth rail solely for operational consistency; the system shares track with Network Rail in several places. Where the track is shared with 750 V third-rail stock, the central rail is bonded to the running rails and the outside rail electrified at 660 V. This allows both types of train to operate satisfactorily. The suburban network of the London & North Western Railway (LNWR) was electrified in co-operation with the Underground, but during the 1970s British Rail introduced third-rail EMUs and the sections of the LNWR suburban network not used by the Underground had the fourth rail removed (see "London and North Western Railway", above). The Underground has carried out studies to consider raising the voltage above the present 630 V nominal. New equipment at their substations does allow for a future increase to a standard 750 V nominal. In addition, the electrical equipment of new trains are also based on the use of 750 V rated equipment. So, whilst new equipment is being designed to for 750 V operation, no decision to increase the voltage has yet been made public by the Underground. This uses bottom-contact composite third rail, with an aluminium body and a steel contact surface. The advantage of this is a low-resistance, high-current-capacity rail with a durable steel surface for current collection. The rail may be surrounded by insulating material on the top and sides to reduce the risk of electrocution to railway staff and trespassers. The bottom-contact system is less prone to derangement by snow than top contact. Volk's Electric Railway was originally electrified at 50 V DC, raised to 160 V in 1884 and reduced to 110 V DC during the 1980s. The elevated "monorail" at the National Motor Museum, Beaulieu uses rubber tyres running on two metal tracks, one on either side of the central guide. Because it is rubber-tyred, it requires two current conductors and two collectors (hence the four-rail designation). Great Britain has used different electrification systems in the past. Many of these date from the early part of the 20th century, when traction electricity was in the experimental stage. This section describes each system, in order of decreasing voltage. 'Elevated Electric' London suburban lines of the London, Brighton and South Coast Railway: The first large-scale suburban electrification scheme; starting with the South London Line and then extended to other commuter lines around the south of London, operational from 1 December 1909. Following the grouping into the LBSCR into the Southern Railway in 1922, all of the 6,600 V lines were converted to the 650 V DC third rail system by September 1929. During the initial electrification of parts of the network to 25 kV 50 Hz AC overhead, the initial solution to the limited clearance problems in suburban areas (due to numerous tunnels and bridges) in London and Glasgow was to use the lower voltage of 6.25 kV. Later technological improvements in insulation allowed these areas to be converted to 25 kV. The last sections of 6.25 kV were converted during the 1980s. The 6.25 kV section was from Fenchurch Street to beyond Barking, with changeovers there on both the Upminster and Tilbury lines. The section between Chalkwell and Shoeburyness was also at 6.25 kV. The remainder was at 25 kV. The sections electrified at 6.25 kV were converted to 25 kV during the early 1980s. The line from Liverpool Street to Southend Victoria was originally electrified at 1,500 V DC overhead during the 1940s-50s. During the early 1960s, the whole of this line was converted to 6.25 kV AC overhead, while the main line east of Shenfield was progressively electrified at 25 kV, with changeover east of Shenfield. During the early 1980s, the line was again converted, this time to 25 kV. The Cambridge line and branches from Liverpool Street was electrified in the early 1960s, with 6.25 kV out to a changeover at Cheshunt, and 25 kV beyond. The Chingford and Enfield lines were thus at 6.25 kV throughout. This route was again fully converted to 25 kV in the early 1980s. As part of the electrification onwards to Cambridge and Norwich in the 1980s, electric locomotives were transferred to these routes from the West Coast route. These locomotives would not have been able to operate at 6.25 kV. On the North Clyde, the central section between Parkhead and before Dalmuir (Clydebank loop) and Westerton (Anniesland loop) were at 6.25 kV, with the outer sections at 25 kV. The Bridgeton and Springburn branches were thus at 6.25 kV throughout. The sections electrified at 6.25 kV were converted to 25 kV during the early 1980s. On the South Clyde, the route from Glasgow Central around the Cathcart Loop was initially at 6.25 kV, with changeovers to 25 kV at Kings Park and Muirend on the Motherwell and Neilston routes. These lines were progressively converted to 25 kV in the 1970s-80s. This was electrified by the Lancashire and Yorkshire Railway in 1913 as part of a trial system for export. The system was converted to third rail in 1918 (see below). After World War I, the UK Government set up a committee to investigate the various systems of railway electrification; in 1921, it recommended that 1,500 V DC overhead should be the future national standard. Several schemes were implemented in its wake, but the Great Depression and World War II meant that very little work was done. Technological advances after 1945 meant that the 25 kV AC system was adopted instead for the West Coast Main line and Glasgow suburban electrification (as set out in the BR 1955 Modernisation Plan). However, at the same time, large amounts of money had been (and were still being) spent converting several lines to 1,500 V DC. A joint LMS and LNER scheme, it opened on 11 May 1931. The success of this scheme influenced LNER's later electrification schemes. The line was converted to 25 kV AC in 1971, but the stretch between Altrincham and Trafford Bar (plus the stretch between Trafford Bar and the Cornbrook viaduct) were later incorporated into Manchester Metrolink and converted again (this time to 750 V DC). Known as the Woodhead Route, the LNER chose this hilly (and busy) main line for its first mainline electrification, with work beginning in 1936. Due to the Depression and World War II, it was not completed until the 1950s. After completion, the government chose to standardise on 25 kV AC instead, leaving the Woodhead Route and the few other 1,500 V DC lines isolated and non-standard. The passenger locomotives were sold in 1969 and saw further service in the Netherlands. In a subsequent rationalisation, BR closed much of this route east of Hadfield in 1981 in favour of the more southerly Hope Valley Line, which serves more local communities. A section of the line between Manchester, Glossop and Hadfield remained open as part of the Manchester suburban network, and was operated by Class 506 EMU's, until it was converted to 25 kV AC in December 1984. The LNER decided to electrify the Liverpool Street to Shenfield section of the Great Eastern Main Line (GEML), known as the Shenfield Metro. Civil engineering works began during the 1930s, but World War II intervened. Work was completed in 1949 and extended to Chelmsford and Southend Victoria in 1956, using Class 306 (AM6) EMUs. It was converted on 4–6 November 1960, in the wake of the BR 1955 Modernisation Plan, to the new standard of 25 kV AC (initially with some sections at 6.25 kV). The rest of the GEML was subsequently electrified. This line ran from Shildon (County Durham) to Newport (near Middlesbrough). The route was initially over the 1825 Stockton-to-Darlington line, then via Simpasture Junction (the former Clarence railway) through Carlton, Carlton Junction to Carlton South Junction, Bowesfield West Junction to Bowesfield Junction, through Thornaby and ending at Erimus Yard (Newport East). In the wake of the electrification of Tyneside by the NER, this coal-carrying line was electrified between 1 July 1915 and 1 January 1916 as a planned precursor to electrifying NER's busy York to Newcastle main line (part of the East Coast Main Line). The LNER removed this electrification system in 1935 (between 7 January and 8 July); the decline in the coal market making it economically unfeasible to undertake the significant renewals required to continue electric operation. The locomotives were stored for other electrified routes. In 1916, the line between Manchester Victoria and Bury was electrified using 1,200 V DC third rail (side contact). The line between Bury and Holcombe Brook which had been electrified using 3,500 V DC overhead in 1913 was converted to this system in 1918. It was abandoned in 1991, when the line was converted to a 750 V DC system and became part of the Manchester Metrolink. This was electrified in 1904, in response to extensive competition from new electric trams. The concept was a success for the North Eastern Railway (NER), a noted pioneer in electrification, as passenger numbers returned to pre-tram levels. As the stock reached life expectancy in 1937, the network was remodelled by London and North Eastern Railway (LNER) to reflect the changing industrial and residential makeup of the area. Electrified at the same time was the dockside branch, where a pair of Class ES1 (formerly NER No.1 and 2) locomotives were introduced in 1905. These British Thomson-Houston locomotives operated from both the third rail and overhead line. British Railways removed the electrification between 1963 and 1967, citing the changing industrial and population makeup of the area which reduced the need for electric traction. Much of the Tyneside network was later re-electrified (using 1500 V DC overhead) as the Tyne and Wear Metro. The Liverpool Overhead Railway was one of the earliest electric railways in Great Britain. The first section, between Alexandra Dock and Herculaneum Dock, was opened in 1893. The line connected with Lancashire and Yorkshire Railway's North Mersey Branch. It was never nationalised, and closed on 30 December 1956 due to extensive corrosion throughout its iron infrastructure (which was deemed uneconomical to replace). The City and South London Railway electrification was unusual (compared with later schemes) in that it used a three-wire DC system. This meant that although the offset centre third rail was electrified at +500 volts in the northbound tunnel, it was electrified at -500 volts in the southbound tunnel. The motors on the locomotives and the incandescent electric lamps in the carriages worked, regardless of the polarity of the supply. The three-wire system was adopted because the initial system was fed directly from the dynamos in the surface power plant at the Stockwell end of the line. It was important to minimise the voltage drop as much as possible, bearing in mind the rather steep gradient on the approach to King William Street station. Underground railway under London operated by the Post Office. Operated between 1927 and closure in 2003. Partially re-opened as a tourist attraction in 2017. ^ a b Network Rail, 2003 Technical Plan, Chapter 11 "Network Capability", page 7 "Electrification". "Approximately 40% of the rail network is currently equipped with electrification." From page 1, total network is 30,764 km, 7,587 km of 25 kV AC, 4,285 km of 650/750 V DC and 28 km of 1500 V DV. Excludes CTRL, LUL, Old Danby test track, bulk of Tyne and Wear Metro, etc. NB it does not state what method of counting length of network is used - i.e. sidings, loops, double track etc. produce different numbers. The UIC statistics that are used in the chart showing electrification in Europe is based solely on line length. Thus, on this count, 11,900 km (38.7%) is electrified. Of the electrified network, 63.8% is 25 kV AC, 36.0% is 650/750 V DC and 0.2% is 1,500 V DC. ^ "42bn of new rail schemes unveiled". The Independent. 16 July 2012. Retrieved 23 March 2014. ^ a b "Electrification of Railways Advisory Committee Final Report" (PDF). London: HMSO. 1921. ^ "Modernisation of British Railways: The System of Electrification for British Railways" (PDF). London: British Transport Commission. 1956. ^ "Modernising the Great Western" (PDF). Network Rail. p. 8. Archived from the original (PDF) on 13 April 2013. Retrieved 11 November 2011. ^ Rail Magazine: Issue 673, Page 14-15, 29 June - 12 July 2011. ^ "NSE Chronology January 1988 to December 1988". Network SouthEast Railway Society. Archived from the original on 10 October 2014. Retrieved 30 January 2015. ^ Garry Keenor (13 November 2010). "The Rebirth of AyrLine: Electrification to Ayr / Ardrossan / Largs – 1986–87". Railwaysarchive.co.uk. Retrieved 17 November 2010. ^ "Railways: Electrification:Written question - 219526". UK Parliament. Retrieved 27 February 2019. ^ "Electrification Cost Challenge Report". www.riagb.org.uk. Retrieved 14 March 2019. ^ "The Wirral Tramway Light Railway Order 1994". www.legislation.gov.uk. ^ "Southern Electric Locomotives". 'Electron'. 1989. Retrieved 19 January 2007. ^ "Merseyrail". NedRailways. Archived from the original on 27 August 2009. Retrieved 17 November 2010. ^ Eric Peissel & Robert Schwandl. "Europe > UK > England > LIVERPOOL MERSEYRAIL". UrbanRail.Net. Archived from the original on 9 November 2010. Retrieved 17 November 2010. ^ "London And North Western Railway Electrification to Watford and Richmond". Easyweb.easynet.co.uk. Retrieved 17 November 2010. ^ Horne, Mike (2001). The Bakerloo line: An Illustrated History. Harrow Weald: Capital Transport. p. 71. ISBN 1-85414-248-8. ^ "Tube facts". London Underground. 2007. Archived from the original on 1 January 2007. Retrieved 3 January 2007. ^ Carmichael, Phil (June 2013). "Power System Planning - Optimal Solutions". Upgrading The London Underground Power Supply System (PDF). London Underground Limited. p. 14. Retrieved 26 April 2014. ^ British Rail Locomotives and other motive power: Combined volume. London: Ian Allan. 1968. p. 11. ISBN 0-7110-0008-5. ^ "The Manchester South Junction & Altrincham (BR Class 505) Stock". The London & North Eastern Railway (LNER) Encyclopedia. 2007. Retrieved 17 January 2007. ^ "Woodhead Railway and its Electrification". Wortley Top Forge Industrial Museum. 2007. Archived from the original on 11 March 2007. Retrieved 14 April 2007. ^ "The Liverpool Street to Shenfield Route AM6 (Class 306) Stock". The London & North Eastern Railway (LNER) Encyclopedia. 2007. Retrieved 17 January 2007. ^ Williams, Stephen (November – December 1985). "The Newport - Shildon Electrification of the North-Eastern Railway" (PDF). Electric Railway Society Journal. Electric Railway Society. 30 (180). ^ "NER locomotive 3 to 12". Desertrailways.tripod.com. Retrieved 17 November 2010. ^ "Locomotive history - NER Bo+Bos". Thewoodheadsite.org.uk. Retrieved 17 November 2010. ^ "The NER Tyneside Electric Multiple Units". The London & North Eastern Railway (LNER) Encyclopedia. 2007. Retrieved 17 January 2007. ^ "The LNER Tyneside Electric Multiple Units". The London & North Eastern Railway (LNER) Encyclopedia. 2007. Retrieved 17 January 2007. Box, Charles E. (1959). Liverpool Overhead Railway. Railway World Ltd.
Gahan, John W. (1992). Seventeen stations to Dingle - The Liverpool Overhead Railway remembered. Countyvise and Avon-Anglia. ISBN 0-907768-20-2. Bolger, Paul (1992). The Docker's Umbrella - A History of Liverpool Overhead Railway. The Bluecoat Press. ISBN 1-872568-05-X. Jarvis, Adrian (1996). Portrait of the Liverpool Overhead Railway. Ian Allan. ISBN 0-7110-2468-5. Glover, John (2003). London's Underground (10th Edition). Ian Allan. ISBN 0-7110-2935-0. Maund, T.B. (2001). Merseyrail Electrics - The Inside Story. NBC Books. OCLC 655126526. OL 18942031M. Moody, G.T. (1979). Southern Electric 1909-1979. Ian Allan. ISBN 0-7110-0924-4. Glover, John (2001). Southern Electric. Ian Allan. ISBN 0-7110-2807-9. Appleby, K.C. (1990). Shildon - Newport in Retrospect. Lincoln: Railway Correspondence and Travel Society. ISBN 0-901115-67-3. Dixon, Frank (1994). The Manchester South Junction & Altrincham Railway. The Oakwood Press. ISBN 0-85361-454-7. Goslin, Geoff (2002). London's Elevated Electric Railway - The LBSCR Suburban Overhead Electrification 1909-1929. Connor & Butler Ltd. ISBN 978-0-947699-35-2. Nock, O.S. (1966). Britain's New Railway. Ian Allan.